Maitake is also known under the name hen of the woods or sheep's head. Regarding the use of Maitake in therapeutic practice, there are three main areas where it is used. First, it's the best fungus I use for the metabolic syndrome. The metabolic syndrome is the name of several diseases that occur together, have common causes and together lead to a number of health complications. 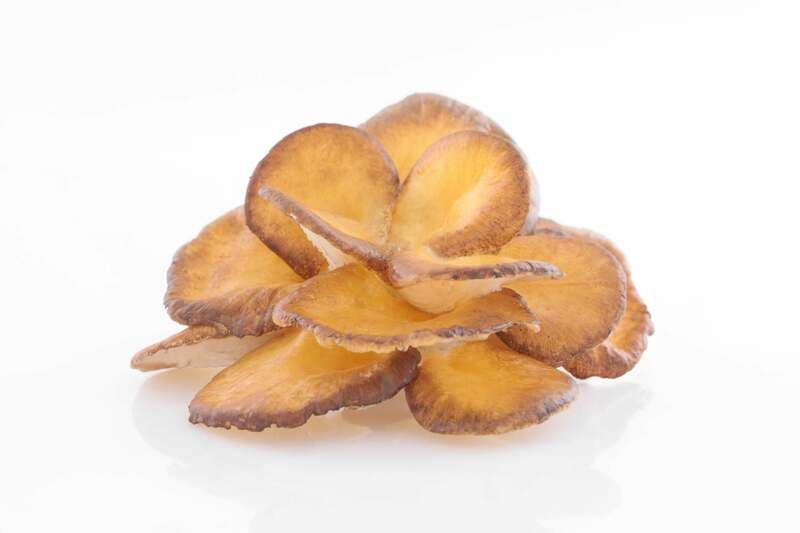 These include diabetes II, where Maitake can reduce glycaemia and increase tissue sensitivity to insulin. Besides reducing the activity of diabetes-related enzymes, Maitake also has a protective effect on the pancreas, as it prevents the destruction of insulin-producing β cells. This is also due to its ability to neutralize free radicals. In diabetes, it is often used in combination with Coprinus. Coprinus has more intensive effects in the case of diabetes, but Maitake solves the issue in a more complex way. Metabolic syndrome also includes high fat and high cholesterol levels, overweight condition, and high blood pressure. We can use Maitake for all these problems. Increased blood pressure can also be directly linked to diabetes, high cholesterol, etc. Maitake affects these issues and therefore contributes to the lowering of blood pressure in this way. One study, however, demonstrated that although there was no change in fat levels in experimental animals, their blood pressure decreased. This could mean that Maitake affects blood pressure by other mechanisms as well. Maitake is also suitable as part of weight loss programs. One observational study, involving 30 respondents, resulted in weight loss of up to 12 kg in 2 months during the administration of Maitake. The other area in which Maitake is the same as other medicinal mushrooms is in possessing a significant anti-cancer effect. It is most commonly used for breast, prostate, intestinal and liver cancer. Combined with other mushrooms. Maitake + Coriolus + Reishi is the most common combination for breast cancer. Due to the fact that Maitake has a positive effect on metabolism, it can also reduce negative effects of conventional therapy, chemotherapy and radiotherapy. And last but not least, it is advisable to use Maitake for osteoporosis. Maitake is able to support bone tissue. It is used for these problems along with Shiitake or Cordyceps. It boosts bone tissue production thanks to the stimulation of osteoblasts. It also increases alkaline phosphatase and supports bone mineralization. Our German colleagues call Maitake a "preventive mushroom for old age". I did not understand this for a long time. Nevertheless, if an elderly patient comes in who has no significant problem, but more like many small problems of all kinds, and he/she begins to take Maitake, he/she gets better overall. We must not forget that Maitake, like other mushrooms and thanks to a high concentration of polysaccharides, also affects our immune system and is particularly strong in the fight against viruses, bacteria and other pathogens. Maitake (Grifola frondosa, trsnatec lupenitý, Hui Shu Hua, Hen of the Woods) is a wood-decaying mushroom that is edible and very tasty. It is very rare to find it in nature, but its environment includes areas in the northern hemisphere. Maitake sporocarps are annuals, and – as the Czech name suggests – they form large clusters that can weigh dozens of kilograms. They are found at the base of trunks and roots of deciduous trees. They are harvested in autumn, most often in September and October. Maitake is undoubtedly best known in Asia, where it is used in the preparation of meals and where its healing effects have been known for thousands of years. Historical sources explain why it is also called the dancing mushroom (Japanese translation). It was a great joy to find this mushroom and the "mushroom pickers" literally danced with joy over their "catch". Traditional Chinese medicine has been using Maitake for a very long time. It is described in the sources of the Han Dynasty (206-210 AD), also the "Chinese herbarium" Shen Nong Ben Cao Jing. The interest in this mushroom has not decreased even today; on the contrary, many studies confirm its positive effects on humans. It has been cultivated artificially and commercially since about the 1980’s. Maitake is a very potent mushroom, especially in patients with metabolic syndrome. i.e. in patients with hyperlipidaemia, diabetes II, elevated blood pressure, etc. It protects against infections and cancer, supports bones and fertility. It is versatile and can be used either as a prevention or as a remedy for health problems.